LG hasn't updated its budget smartphone lineup for quite some time now. The K-series was introduced about 3 years ago and focussed mainly on the budget end of the market. These smartphones got a refresh in 2017 and some of them made their way to India. The LG K-series models had to face stiff competition from multiple manufacturers in the budget segment. LG did not move a lot of units nor did it manage to make a significant impact in the price segment. As a result, multiple LG K-series smartphones were launched across the world but very few made it to India. The catalogue reveals that the smartphone will have an HD+ (720x1440 pixels) display with an 18:9 aspect ratio and a DPI of 280. 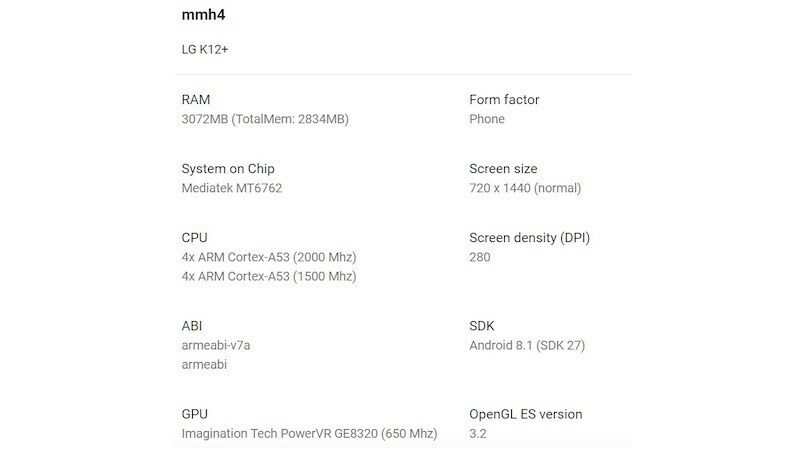 It seems to be powered by a MediaTek MT6762 chipset and has 3GB of RAM. MediaTek MT6762 is an octa-core processor with four Cortex-A53 cores clocked at 2GHz and the other four Cortex-A53 cores clocked at 1.5GHz. It has a PowerVR GE8320 GPU that is clocked at 650MHz. The smartphone will ship with Android 8.1 Oreo, which is disappointing given that Android 9 Pie has been available for a while. While the LG K10+ and the LG K11+ did not make it to India, it'll be interesting to see if the K12+ makes it to our market.